What did the Bunker Hill Flag really look like? How is a flag different from an ensign? What's a guidon? Inquiring minds want to know—and WAR FLAGS has the answers! 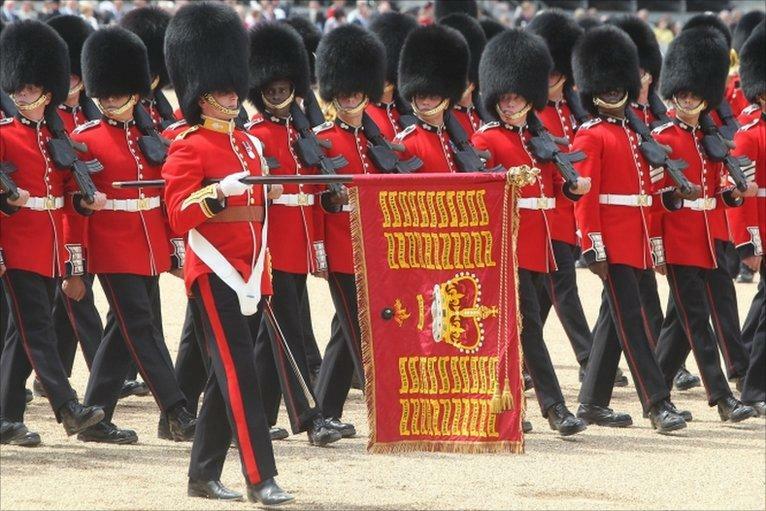 The Colonel's Colour of the Grenadier Guard is dipped in salute to Queen Elizabeth II during the Trooping the Colour ceremony on 12 June 2010, Her Majesty's 84th birthday. Though the Queen was actually born in April, it has long been the custom to hold the monarch's official birthday celebration on a Saturday in June. The ceremony's origins go back to the early eighteenth century, when the regimental colours were paraded or "trooped"down the ranks so that every soldier would see and recognize them. Since 1748 the colors have been trooped on the monarch's birthday and since the reign of Edward VII the sovereign has taken the Royal Salute in person.